I'm a member of a Biohacking Facebook group and recently there was a post from someone seeking an alternative to Amphetamines for his ADHD. He was heavily reliant on making sure his prescription was filled every month and he was looking for a change. There were a heap of great recommendations from people focused around Meditation and Mindfullness but not one suggestion about trying essential oils. Many of you may be familiar with the study conducted by Dr Terry Friedman on kids with ADHD back in 2001, but if you aren't, here is the cliff notes version of it. Vetiver, Cedarwood, Lavender were the oils used in the study. Participants were asked to inhale the oils when they felt scattered and unfocused on a 30 day rotational basis. The final results were pretty damn astonishing! Lavender increased performance by 53%, Cedarwood increased performance by 83% and Vetiver increased performance by a whopping 100%. The inhalation of the oils, specifically Vetiver, proved to settle the brainwaves back into normal patterns and improved the scholastic performance and behavioural patterns of the participants. Awesome hey? Yes Vetiver is an amazing tranquilliser (for me anyway) but it also has the ability to quieten the mind, increase concentration and enhance mental acuity. This makes it a super valuable oil for high strung kids (or adults) with behavioural or learning difficulties. Peppermint would combine really well with Vetiver specifically for concentration as would Litsea and Rosemary. Both Rosemary and Litsea are two oils that have been found to enhance our ability to recall information. Aromatically that would also be a really gorgeous combination to try. 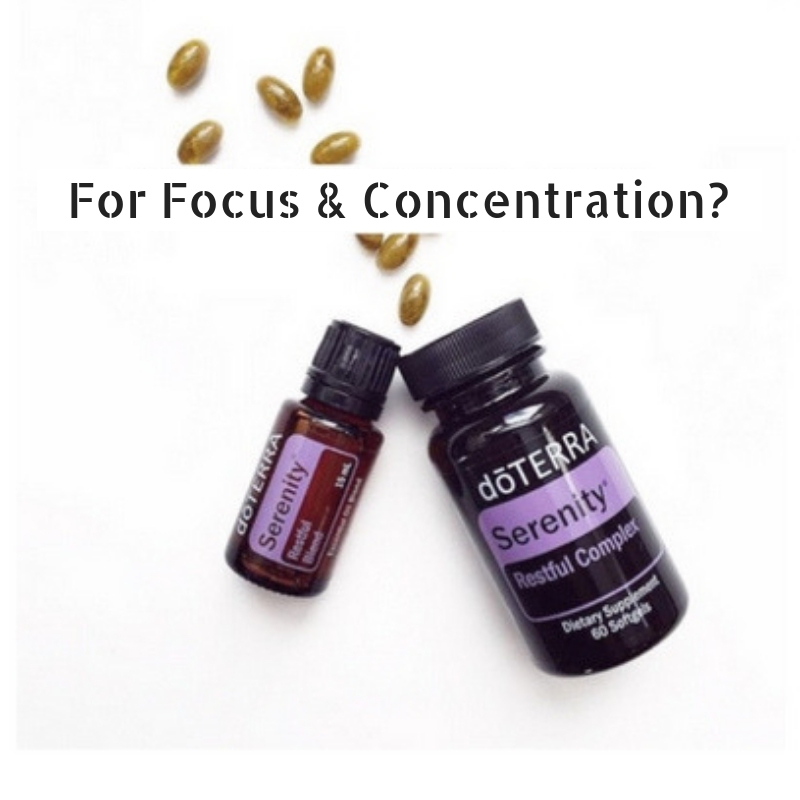 An unlikely product that we really wouldn't associate with focus and concentration is doTerra's Serenity Restful Complex. See doTerra were super clever with the formulation for the Restful Complex by including L-Theanine which behaves similarly to Vetiver. It can both relax and calm the mind whilst increasing our ability to focus and concentrate. This activity is why some people utilise L-Theanine to achieve deeper states of meditation and why some people love using the Restful Complex before public speaking events. L-Theanine is an amino acid extracted from Green Tea that has strong cognitive enhancing properties. It increases production of alpha brain waves, which are the brain waves that increase creativity, decrease depression and are present when we consciously practice mindfulness or meditation. It's also a glutamate antagonist, meaning it blocks glutamate receptors in the brain, which is part of the reason for it's calming effect. Glutamate is an excitatory, meaning it stimulates the brain, therefore having too much of it in the body can often be an underlying concern contributing to ADHD. GABA levels in those with ADHD are nearly always found to be low. GABA is a neurotransmitter which is calming and inhibits the excitatory response of Glutamate. Getting the balance of GABA vs Glutamate is critical. Most people report that there is a significant decrease in 'mental clutter and chatter' when using L-Theanine and notice a great improvement in their overall mood as well. The side bonus is that L-Theanine also improves the quality of our sleep which is particularly important for those with ADHD. Research has shown that those with ADHD generally get less high quality sleep and we all know the profound impact a crappy nights sleep can have on our learning ability and mood. The Restful Complex couples L-Theanine with Lavender which we know from Dr Friedman's study positively impacts cognitive function as well as Passionflower and Roman Chamomile, both very soothing to the central nervous system and encourage activation of the Parasympathetic nervous system. Anywho, there is a tonne of research and testimonials out there for the efficacy of L-Theanine and Vetiver on this particular topic so please do take a moment to explore it! I hope this info helps someone and if you have had a positive experience with Vetiver or the Restful Complex I would LOVE to hear it! ​doTerra's Serenity Restful Complex is currently only available via the US warehouse for $23.50US or $34.50AU with a wholesale account + shipping.